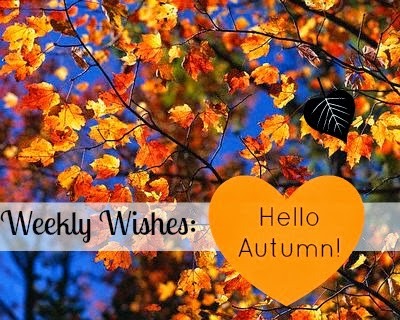 New Wave Domesticity: Weekly Wishes : Hello Autumn! Yesterday marks the official day of fall. It has been an amazing summer full of adventures and beautiful moments, but I am really looking forward to quiet fall afternoons cozied up under blankets with a cup of tea. For me, fall also means welcoming the rainy season back to Portland and pulling out my rain boots and pretty umbrellas. I have been wanting to participate in the amazing Melyssa's weekly wishes link up for awhile now and today seemed like the perfect day to start a new tradition, particularly since this next week's theme is happiness. This week, I want to embrace the changing of the seasons with open arms. Instead of resisting the end of summer, I want to be excited about the months to come and I want to enjoy all the little things autumn will bring. I want to decorate for Halloween this week and get into the spirit of chilly nights and warm colors. I also want to take the time to decorate my new little office and work and make it a space full of celebration and happiness. This week, I am going to embrace all of these lovely things, decorate, and make plans for cute fall activities. It's a really simple thing, but I want to start this season off on the right foot! What are you guys looking forward to about fall? I am right with you on getting Halloween decorations UP. I love fall, but the transition of the seasons always leaves me feeling just a little bit sad. As if I didn't miss fall enough already. You are torturing me. Post pictures! Have fun decorating for Halloween. Oooo I am so excited for fall too. My leaves are starting to fall and I have this crazy old lady neighbor who keeps trying to clean them up. I had to yell at her to get her to leave them alone. I also started my first simmer pot of potpourri yesterday. Love it! That sounds awesome! I wish we had more trees in my neighborhood that changed color, fall leaves are the big thing I miss from the east coast! Oooh, a simmer pot of potporri? My mom used to do that and maybe I should give it a try! Do you use the stove? Or one of those electric warmers? On the stove! I used one sliced orange, a cup of fresh cranberries, 3 cinnamon sticks, and 1 tbsp of cloves. Of course you can do whatever you want for ingredients. I filled a large pot with water so everything was floating, brought it to a boil, and then turned it down to low. (2 on my dial, with a range of 1-10). And just left it there all day (while I was home of course.) I put the lid on it overnight and use it again the next day too! My husband and I moved from New York to Hawaii this summer. No small jump! But as much as we're loving island life, I'm missing my upstate autumn!